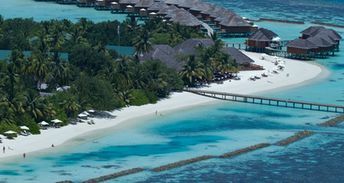 This beach ranks #9 of the "Best beaches in South Ari atoll"
Vakarufalhi Island Resort is a cozy 4-star property with room's fares starting from US$350 per night, featuring excellent Italian cuisine. Despite some minor claims from guests, value for money is very good, and you can hardly find something better for that money. The best is to take "all inclusive" package. Fly to Male international airport (MLE). Next take a seaplane (US$380 adult / US$240 child of 2-11 years). The best time to travel to the beaches of Vakarufalhi island is a dry season in the winter half of the year.